**NEWS ALERT** Iron County Snowmobile Trails will open Thursday December 6th. Please expect early season riding. You will encounter some wet areas, some areas with thin snow, and not all trails have been groomed. 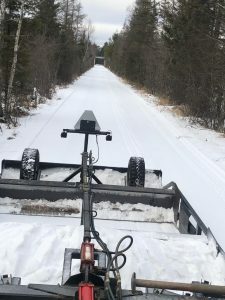 At this time Wednesday afternoon, the only trail we have groomed is Trail 17 (the grade) from Lazy Ace heading north, this trail is fair to good with a nice base. Trail 182 will remain closed for this weekend. The gate at Hwy 51 past Lazy Ace. will remain closed until Vilas County opens their trails. Also, Trail 8A is not passable and will remain closed until we can complete a snow bridge. At this time the lakes are not marked and ice conditions vary this time of year, please use extreme caution. As we continue to groom more trails we will keep everyone updated. Let’s Ride! The Great Northern will run a Snowmobile Special for this weekend and next weekend, all rooms will be $89, just mention “Early Riding” at the time of booking.